There isn't a lot of P3 owners posting, so I had to write something about this, too good to miss out on. I've had a P3 for a few months now and have spent most of my time playing Lexi and I've kept the Cannon Lagoon playfield sitting in the box under the cab. I had taken it out to play it a few times when I got the machine, looked cool, game was pretty basic (redemption style) so I put Lexi back in and hadn't thought much about it. After my kids had opened the box a few times to check it out and bug me to install it, I decided to give in and took the whole 2 minutes it takes to swap it in. Super glad I finally did! Now the kids play it constantly. After a few days of seeing them go at it non-stop I decided to finally sit down and give it a shot and was super impressed. It is a short game, but challenging to make it all the way through with a good score. Basically, you can't afford to miss a single shot in a 7-8 minute sequence of shooting an increasing number of ships at increasing speeds. Once you make it through, there is a Kraken you need to beat which requires you to shoot the tentacles he hides behind to get a shot at the head. Now we're playing the game every night seeing who can beat it first. The little kids can get involved quickly and they've started to play ROCs and other games as they've progressed. It's also helped them understand the rules of the other pinballs as well, considering most of the older games call outs are a little less than obvious sometimes. Definitely been a great way to get them hooked on pinball. 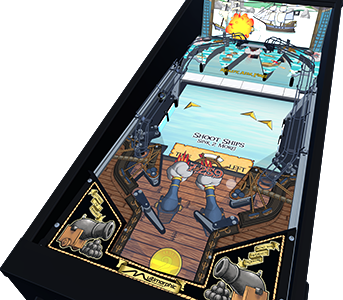 I can't wait for the Pinball Wizard software that uses this play field, looking forward to the additional challenge and something for them to progress further with. Overall I'm happy with the P3, I've put about 750 games on it and haven't had any issues. It stands up well in a line up with the new Stern and Jersey Jack pins, lots of room for future development! Thanks for the post. I'm hoping to locate mine at a local movie cinema, and I'm sure CL will be popular during the school holidays. I always jump on the P3 at the Texas shows and I got to say Cannon Lagoon is highly addictive. If no one is standing around waiting, I can easily put a dozen games on it in a short amount of time. Its like Duck Hunt with flippers. Really glad you and your family are enjoying it! I'm looking forward to the day my kid is old enough to sink those ships. We iterated on the core gameplay and mechanics *a ton* to find the right mix of something that was fun and intuitive for kids and non-pinball players but challenging and rewarding for even the best players. Hitting the right balance of player feedback, instructions, and non-score objectives was a bigger challenge than I expected but I'm really happy with the result. I so wish I had the money for one fo these. Play it at every show when I see it. Been a fan of it for years. If I had 10k to spend on a pin, this would be the one I would buy. Great write-up! It's gratifying to hear you're all enjoying the variety and different gameplay of CL and ROCs. Also, I'm confident you'll see a LOT more value added to that CL playfield (with Wizard, HeadsUp, and many other games). It's a very non-traditional and straightforward layout, and it enables tons of interesting ideas. Great game. Still trying to beat the Kraken.. P3 is the most played machine in my collection. You’ve got all the Multimorphic stuff, nice! Now we're playing the game every night seeing who can beat it first. When you get good to enough to beat it fairly regularly, try making some settings harder (more ships, faster ships, less time per level, more difficult kraken settings).